No, I don’t mean the kind of reanimated corpses you encounter when you teach an 8:30am econometrics class. On a recent day in my natural resource economics class, I set the students free to construct an economic model of zombies as a recreational hunting species. These students have spent the semester so far analyzing models of resource use including how to efficiently and sustainably use renewable resources such as fish or deer. But ultimately what I want to teach them is a way of analyzing issues that can be applied to new problems. 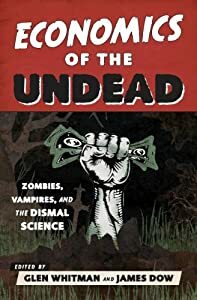 In my chapter in Economics of the Undead, “Zombies as an Invasive Species: A Resource Economics Perspective”, I suggest that in the inevitable event of a zombie invasion, a possible control method might be to encourage zombie hunting for sport. Building upon this idea, I set the students loose to think through the problem of how to make the best use of zombies as an economic resource. I gave the students minimal guidance, letting them take the discussion in any direction they chose, and they had to make many choices and assumptions along the way. Since the idea of allowing free-range zombies was understandably a little troubling to them, they chose to build upon an idea I raise in my chapter: private zombie-hunting preserves. This keeps the zombies in check so that humans are not in danger, but it also raises an interesting problem: if zombies are contained, then there is no natural reproduction to maintain the zombie stock as there is in most of our bioeconomic models. Assuming that zombie hunting is a popular sport and we want to continue it in a sustainable way, this would require a steady stream of new zombies. As mentioned in my chapter, one way would be to limit head shots in some way so as to prolong the hunting value, but students recognized this as only a short-term fix. They needed some other way to replenish the herd. Unlike my own (perhaps dated) concept of zombies being created by a bite from another zombie, most students were familiar with a more modern idea of zombies from The Walking Dead, in which anyone who dies is reanimated as a zombie. Making this assumption, they decided that deceased humans would be delivered to the preserve to restock the zombie population. Working through the implications of the model, this led the students to the logical conclusion that the rate at which we could sustainably harvest zombies would be constrained directly by the mortality rate of humans outside the preserve. Oddly (to me), students took this rate as given. The larger question of whether altering this rate could result in an improvement in economic welfare was not investigated. Students truly enjoyed this exercise and it was very instructive for them to have to build a model of a new situation and see how the assumptions they put into the model lead to the conclusions at the end. Several of the students have told me since then that they were a little skeptical of the exercise at the start, but that it turned out to be one of their most memorable days of class. Michael O’Hara is an assistant professor of economics at Colgate University, where he teaches and publishes in environmental and resource economics and econometrics. This entry was posted on Wednesday, November 19th, 2014 at 4:53 pm	and posted in Uncategorized. You can follow any responses to this entry through the RSS 2.0 feed. Great post, but if the optimal number of zombies is not zero, then what is it? As far as I can tell, the optimal level must be a function of how many people derive utility or enjoyment from hunting zombies, which in turn is a function of substitute and complementary zombie-hunting activities! So, how do we measure the utility of zombie-hunting for sport? Willingness to pay? It does seem like willingness-to-pay would be the right criterion. But if the sustainable zombie harvest is equal to the death rate of the human population (as Michael’s students realized), then it sounds like the supply curve is vertical, or becomes vertical at that quantity. The position of the demand curve will establish the market price, but the quantity will be fixed. Then again, if people have a high enough discount rate, it might end up making economic sense to run down the zombie population faster than it’s replenished.